Husband and wife duo – Kori Gardner and Jason Hammel – Mates of State played a really great, fun set on Wed night. In town for their new album Mountaintops, the band played a good chunk of the new material. Theyve also added an additional 2 members to their live set. The guy on the right – drenched in sweat by the end of the night – played his heart out, and worked the stage and delivered on all the instruments. It was a great addition to the band giving them an even fuller sound. 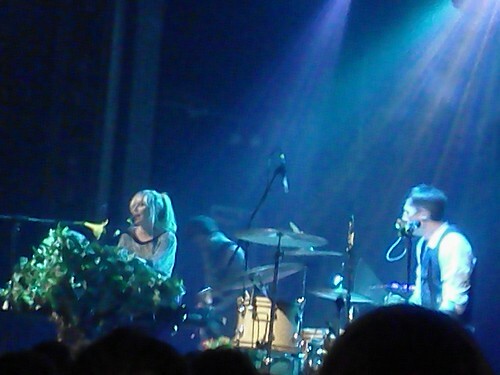 Kori was surrounded by plants/shrubbery which obscured her for those of us in the front. You could make out her blonde hair bouncing around as she jumped and clapped to songs. At one point, the audience wanted to see her and she happily obliged. From much further back, the sound was much better and of course, you had an entire view of the band. The encore included their more popular ‘My Only Offer’, thank you Gossip Girl, and had the crowd singing and dancing along. Their fans are a great balance between younger and older and everyone seems to just love and adore everything they do. The band also made a point during each of the openers to come out and bring them glasses of tequila. They seemed to really enjoy the openers on tour with them and it was great to see everyone liking each other. Other Lives, from Stillwater, OK, were a great opener. With a unique sound of folk-indie music, the band nearly outshined the headliners. The band has a great sound with the band members each playing different instruments on the songs. It was great to see the upright bass and violin make appearances on some of the songs. The lush melodies created were just beautiful and filled up the space of Webster Hall. And while there isnt much crowd interaction, the band brings you right in. It was great to see a lot of people just come out to see them. They have been acquiring quite the fan-base so it was no surprise when people weren’t familiar with Mates of State, but were only there to see Other Lives. Many it seemed, took off soon after MoS took the stage with a pretty different sound and definitely more poppy. And Yawn – oh why did you come up with such a poorly named band. Sadly, they actually lived up to their band name. They were pretty forgettable and for an opener it actually was close to putting me to sleep. Perhaps its irony at its finest and the band is doing what they set out to do.